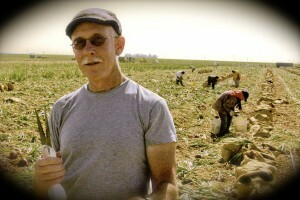 David Bacon, writer and photographer, brings stories about farm workers to urban readers. Photo courtesy David Bacon 2013. Fifty years ago the great grape strike started in Delano, when Filipino pickers walked out of the fields on September 8, 1965. Mexican workers joined them two weeks later. The strike went on for five years, until all California table grape growers were forced to sign contracts in 1970. The strike was a watershed struggle for civil and labor rights, supported by millions of people across the country. It helped breathe new life into the labor movement, opening doors for immigrants and people of color. Beyond the fields, Chicano and Asian American communities were inspired to demand rights, and many activists in those communities became organizers and leaders themselves. California’s politics have changed profoundly in 50 years. Delano’s mayor today is a Filipino. That would have been unthinkable in 1965, when growers treated the town as a plantation. After 50 years that curtain of silence is lifting. Dawn Mabalon, a history professor at San Francisco State University, has documented the radical career of Larry Itliong, who headed the Agricultural Workers Organizing Committee (AWOC), one of the two organizations that carried out the 1965 strike. Itliong not only shared leadership with Cesar Chavez, but actually started the strike. In tens of thousands of words Matthiessen only mentions Itliong twice, in passing. The Delano strike was not spontaneous or unexpected. It was a product of decades of worker organizing and earlier farm worker strikes. Leaders of the grape strike, like Itliong, had helped organize previous unions, including ones expelled from the CIO in the anti-communist purge of 1949. The timing of the 1965 strike was not accidental. It took place the year after civil rights and labor activists forced Congress to repeal Public Law 78 and end the bracero contract labor program. Farm worker leaders then acted because growers could no longer bring braceros into the U.S. to break strikes. The 1965 strike did not, in fact, start in Delano. In Coachella, where California’s grape harvest begins, Filipino workers went on strike that summer. They won a 40¢/hour wage increase from grape growers, and forced authorities to drop charges against arrested strikers. Larry Itliong organized the Coachella strike. He and the Filipino workers of AWOC then started the walkout in Delano. Itliong had a long history as an organizer, going back to the 1930s. He was a protégé of Ernesto Mangaoang, a revered leader of the CIO union for Alaska fish cannery workers, Local 7 of the United Cannery, Agricultural and Packinghouse Workers of America. Itliong himself ran for office in that union. The Federal government accused Mangaoang of being a Communist during the McCarthyite hysteria, and tried to deport him to the Philippines. After UCAPAWA (renamed the Food, Tobacco and Agricultural Workers) was destroyed in the 1949 purge of the CIO, Local 7 was taken in by Harry Bridges’ union, the International Longshore and Warehouse Union. It became ILWU Local 37, and today is part of the ILWU’s Inland Boatman’s Union. In leftwing unions Filipinos and other farm workers mounted huge agricultural strikes in the 1930s. After World War Two, Local 7 struck Stockton’s asparagus fields in 1949. Itliong was active in that strike, as was Chris Mensalvas, who later became Local 37 president. The Federal government also tried to deport Mensalvas as a Communist. In the early 1950s Filipino farm workers continued to organize with the National Farm Labor Union, headed by Ernesto Galarza (author of Merchants of Labor – The Mexican Bracero Story). They struck the giant DiGiorgio Corporation, then California’s largest grower. In 1959 the Agricultural Workers Organizing Committee (AWOC) was set up by the American Federation of Labor, which had merged with the CIO to form the AFL-CIO in 1953. Despite the federation’s conservative politics, AWOC hired Itliong as an organizer because of his long history among Filipino workers. AWOC used “flying squads” of pickets to mount quick strikes, and struck the Imperial Valley lettuce harvest in 1961-2, demanding $1.25 per hour. Many Filipino workers in Coachella and Delano were members of ILWU Local 37 in 1965, when the grape strike began. Every year they would travel from the San Joaquin Valley (where Delano is located) to the Alaska fish canneries. Through the end of their lives, they were often active members of both Local 37 and the United Farm Workers. Cold war fears of communism were strong in the 1960s – one reason why the contributions of Itliong and the Filipinos were obscured. The strike in Delano owes much to Cesar Chavez, Dolores Huerta, Gilbert Padilla and other Chicano and Mexican leaders who came out of the CSO. But the left wing leadership of Itliong, Philip Veracruz and other rank-and-file Filipino workers was equally important. The alliance between Itliong’s AWOC and the Cesar Chavez-led National Farm Workers Association was a popular front alliance of workers who had, in many cases, different politics. AWOC’s members had their roots in the red UCAPAWA. NFWA’s roots were in the Community Service Organization (CSO), which was sometimes hostile to Communists. Yet both organizations were able to find common ground and support each other during the strike. They eventually merged to form the UFW. Both the Filipinos and Chavez, in the CSO, opposed the bracero program. To organize farm labor they sought immigration policies favoring workers, which would keep growers from using braceros to break strikes. The Delano strike was a movement made up of immigrant workers, who wanted to keep growers and the government from using immigration policy against them. Their opposition to contract labor programs is as important for immigration reform today as it was in 1965. Chavez willingly acknowledged that the NFWA hadn’t intended to strike for another two or three years. The decision to act was made by Filipinos – left wing workers. It was a product of their history of militant fights against growers. The political philosophy of the Filipinos saw the strike as their fundamental weapon to win better conditions. The 1965 grape strike was started by workers on the ground, not by leaders or strategists far away. Although some couldn’t read or write, as Matthiessen charged, they were politically sophisticated. They had a good analysis and understanding of their situation as workers, and chose their action carefully. In Delano Filipinos used popular front ideas they’d used before – that workers and organizations with different politics, or of different nationalities, could work together to win fundamental social change. Growers had pitted Mexicans and Filipinos against each other for decades. When Filipino workers acted first by going on strike, and then asked the Mexican workers, a much larger part of the workforce, to join them, they believed that workers’ common interest could overcome those divisions. Strikers in Delano developed close friendships and personal connections with each other. Many of the Filipinos died as single men, because anti-miscegenation laws prohibited them from marrying non-Filipinas, and the immigration of women from the Philippines was limited until the late 1960s. Cesar Chavez’ son Paul recalls the way the older Filipino men looked at him and other children of Mexican strikers as their own family. In the wake of the grape strike, the UFW and scores of young activists from California cities built a retirement home for them in Delano, Paolo Agbayani Retirement Village, to honor their contribution. 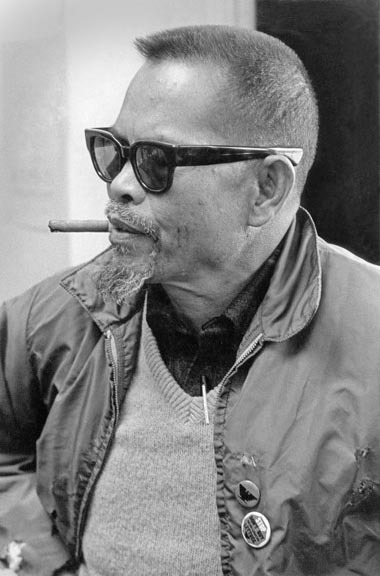 Philip Veracruz, a Filipino grape picker who became a vice-president of the UFW and later left over disagreements with Chavez, wrote during the strike’s fourth year: “The Filipino decision of the great Delano Grape Strike delivered the initial spark to explode the most brilliant incendiary bomb for social and political changes in U.S. rural life.” The contribution of these Filipino workers should be honored – not just because they helped make history, but because their political and trade union ideas are as relevant to workers today as they were in 1965. The first school in the nation named after Filipino American labor leaders is in Union City, the Itliong/Vera Cruz Middle School. The New Haven Unified School District Board approved the renaming of Alvarado Middle School, effective January 2016. This article was reprinted from David Bacon’s website The Reality Check. Bacon is a member of the Guild Freelancers. Cesar Chavez, farm worker labor organizer and leader of the California grape strike, circa 1965. Photo by George Brich/AP.